LGBT are reporting for duty as they face what many think could be their biggest threat since the AIDS crisis: A Trump-Pence presidency. Exit polls show that lesbian, gay, bisexual and transgender voters overwhelming sided with Hillary Clinton on Nov. 8, with 78 percent of the community voting for the Democratic candidate. As the shock of Donald Trump's election victory sinks in, though, many may wonder—just who are the 14 percent of LGBTQ voters who support the Trump-Pence administration. Donald Trump’s stunning victory last week set off a frenzied panic within the gay world, sending its most prominent activists into full-on battle mode. 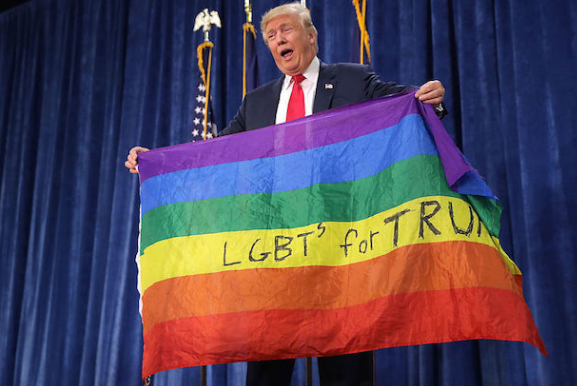 LGBT believe Trump is poised to erase decades worth of painstaking work, overturning President Obama’s executive actions, including the one he signed in 2014 prohibiting federal contractors from discriminating on the basis of sexual orientation and gender identity. Other lesbian, gay, bisexual people, trans people protections at risk include those against discrimination in health care and government-sponsored housing.